The Ohio Nature Blog: What is Your Favorite Animal? I absolutely love turtles, and have since I was very young. I have two very early memories- watching painted turtles with my grandfather at the Seiberling Naturerealm in Akron, Ohio, and of my first pet turtle, which my parents found crossing the street in Silver Lake, Ohio. Fortunately, the midland painted turtle, Chrysemys picta marginata is a hardy species and can be seen in almost any slow moving body of water in Ohio. Our retention ponds and wildlife area at our office supports a healthy, reproducing population. The little guy above is about the size of a 50 cent piece! And about keeping them for pets- I don't recommend it- even though they aren't rare, they are still fall under the Division of Wildlife guidelines-you must register any native pet reptile or amphibian with the DOW. 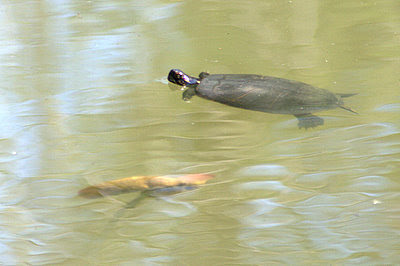 There are several age classes on the campus, and the ponds seem to be filled with more and more turtles each year. I wonder how they got here? Did an employee release a few and the population has exploded? There are even big, old turtles, such as this one floating in the water. As they age, the coloration dulls. 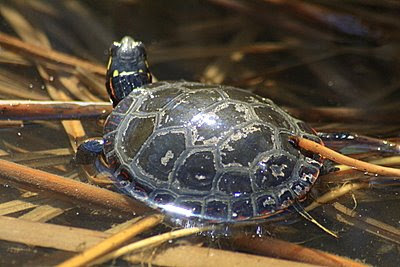 Painted turtles shed the outer covering of their scutes, which is made out of a finger nail like substance. You can see the outer covering of the shell peeling away. Shedding the very top layer of the shell each year also helps them get rid of any algae or other gunk that may be growing on their shells. This turtle's scute covering seems to be flaking away rather than peeling away in one piece. So there you go, since I have such fond memories of painted turtles, and I'm a turtle fanatic in general (I recently started a turtle and tortoise video blog), I'm going to have to say they are my favorite species on the planet. What is yours? I too have always been partial to turtles. Unfortunately, I've never seen any in our pond, although we do have box turtles and an occasional migrating snapper. Great photos and informative narrative. I'm pretty substantially fond of turtles, too. But favorite? That's such a hard thing to pick. It depends on my mood! My favorite has to be mantids. Well, I would have to say the Wren Family as a whole is my favorite species..
My most favorite is the Canyon wren calling down the steep-walled canyons. Second is the Cactus wren calling in the desert scrub. Third is the Carolina and Bewick's wrens which we have here at home (great songs). Fourth is the Marsh wren with his frantic darting in and out of the reeds. All of the other wrens are tied for fifth. This is an interesting post. Thanks for sharing. It was fun thinking about this. Turtles are very cool & plentiful here in S. Louisiana. We actually have box turtles that wander across our yard on occasion (particularly after heavy rains.) I have a hard time watching videos of those tiny baby sea turtles racing for the water after they hatch--the typical slaughter that results makes me cry every time. What's my favorite animal? Jeeze...that's a SERIOUS toughy. Does my husband count? No, I guess not, really. Wow...I think I'm going to have to give this one some thought. I don't know that I can pick just one...Great question! Neat shots! I can see why you find them fascinating....and that was interesting information for the uninformed, like me. How can anyone pick a favorite animal with so many to choose from????? I am particularly fond of seals, though I like to photograph whatever wildlife I can find. Peru is a great spot for turtles - they are very common there and butterflies often swarm around them - very photogenic. We have these in some ponds and canals now.. bought as tiny pets.. because of the Teenage Ninga Turtle craze.. not got to big or unwanted and because of stupiditity or laziness they have be released into ponds... Most die or get eaten by the Herons. You asked about favourites.. I think it as to Raptors.. I have always liked Hawks and Falons.. I like Ferrets, Polecates, Stoats and Weasles. All the above are predators. The other things are Bees Wasps and Moths and Butterflies..
Ha! See I can not get it down to just one thing though. Everyone- I'm glad this post got us all thinking! Cindy- Mantids are really cool. The fact that they can move their eyes around and look in so many directions really creeps me out when I'm trying to photograph them. Troy- Excellent. Wrens. They are great birds. My wren list is fairly paltry- only the house, Carolina, and winter wren are on it. Lana- I love box turtles as well. Terrific animal, and a very endangered one as well for a multitude of reasons. What is so fascinating about box turtles is how there are several different species covering the states east of the rockies. Megan does love cows. She even has a book that is sort of like a field guide to the different breeds of these creatures. I have come to appreciate these animals more as I have learned about them. My question: are there any wild cattle species? Kiris- Seals, excellent. We definitely do not have seals in Ohio, but I have been fortunate to photograph harbor seals and gray seals off the coast of Maine. Tom W.- Raptors. Fascinating creatures, certainly. I'm enjoying watching live video, along with thousands of other people, of a peregrine falcon incubating her eggs (with occasional help from her man friend) atop a skyscraper in downtown Columbus. Last year the eggs did not hatch- we all have our fingers crossed this year.